We may have been feeding you sandwich creations for nearly 5 years but we still consider ourselves very much a start up among all of the amazing food institutions in this town. We always like to do a little something special for start up week and this year is no different. We’re pleased to present this week’s special “The Starter”. Think your favorite appetizer, spinach artichoke dip, deconstructed. 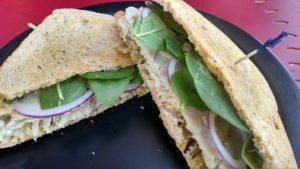 For this sandwich we paired our house roasted turkey with fire grilled artichoke hearts & our roasted garlic Parmesan aioli grilled on Bluff View Bakery tomato basil bread topped with baby spinach and red onion. Comfort is king and this one will warm you right up and make you even happier than that appetizer from the chain restaurant last night!